We can hear it now: What? Fennel? Fennel’s not Southern! Eggplant, salsify and, yes, fennel, to name a few, have been grown in the Charleston area since the eighteenth century. History aside, pickled shrimp and fennel are perfectly complementary. After all, we often encounter fennel’s close cousins, dill (or dill seed) and celery (or celery seeds), in many preparations of this classic hors d’oeuvre. 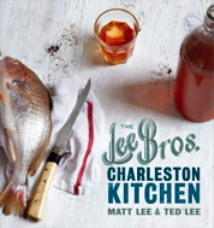 Served in a bowl for self-service with toothpicks, pickled shrimp may also be a passed hors d’oeuvre on a plate if you use the sturdy bamboo picks found in many party stores these days. 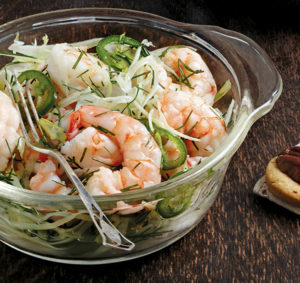 One of the advantages of this recipe is that the marinated fennel pushes the pickled shrimp into the cold-salad realm: it’s easy enough to strew several of the shrimp and strips or rings of the fennel over butter lettuce to create a pretty appetizer salad. 1. Fill a medium stockpot with 2 quarts of water, add 1 tablespoon of the salt, and bring to a boil over high heat. Prepare an ice bath in a large bowl. When the salted water boils, turn off the heat, add the shrimp, stirring them once or twice to distribute them, and cook until uniformly pink-opaque and just done, about 1 minute. With a slotted spoon, transfer the shrimp to the ice bath. Reserve 2 cups of the shrimp-cooking liquid in a medium bowl. 2. With the slotted spoon, transfer the shrimp to a plate lined with a double thickness of paper towels. (Don’t dump the ice bath yet!) Add the vinegar, lemon juice, and chile to the bowl with the shrimp-cooking liquid and whisk in the remaining 1½ teaspoons salt and the sugar until dissolved. Set this bowl of brine in the ice bath (add more ice to the bath if needed), and whisk until the liquid cools to room temperature.